Books sweep you away into their world, but historical fiction makes you live in it. 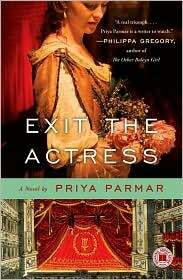 Exit the Actress by Priya Parmar takes place in the mid-1600s and tells the story of Ellen Gwynn, also known as Nell. Starting out as an orange seller to the audience during theater productions, and with a mother who is an alcoholic and a sister who is a prostitute, Nell rises into the world of stage acting and catches the eye of King Charles. Simultaneously becoming a friend to his queen, Nelly also becomes mistress to him. This could certainly present a problem, but Ellen's a sweet young woman who doesn't have ill intentions. She simply loves her man, loves her family, and loves her friends and she tells her story through journal entries, and it's one that truly captures the imagination effectively. Ellen was very much the people's actress, a young woman who rose up through society's ranks and became one with the King's courts, gallivanting with them on trips to the countryside, and developing relationships with noted historical figures. It was such a simple task to connect with Ellen and I found every single journal entry to be so engaging and cleverly written. I blushed in certain spots, giggled in others, and raged against injustices. I was hooked on the story, and the story didn't let me go. If you like historical fiction, go get this one. You won't be disappointed. You'll enjoy each endearing page as the story unfolds. Visit the author on her blog by clicking here. FTC Disclosure: I received the book from the publisher in exchange for my honest opinion. I do like some historical fiction, but that time period doesn't appeal to me much for some reason. I love historical fiction, and haven't read a lot about this time or subject. This book has been on my radar for a long time, but I am not sure if it's on my wish list yet. It's going on there now, and I thank you for your enticing and excellent review! I've heard only good things about this book, and can't wait to read it. It sounds a bit like The Crimson Petal and the White, which I loved. Sounds lovely! I haven't read many books set in the 1600s, so maybe this one would be a good one to rectify that. I think it can be hard to successfully use the journal entry device, but from what you say Parmar pulls it off. Great review! I've heard some great stuff about this book. I know quite a bit about theatre in France in the 1600s, but my knowledge of 1600s theatre in England is next to nothing! I definitely would like to read this book. Every review I've read of it has been positive. I've wanted to read this one for a while, but haven't had the chance to pick it up yet. I'll have to do so soon once I get caught up with everything! :D Great review! This book is new to me - thanks for the review. Great review! I was totally wrapped up in the time period as well and spent a fair amount of time googling things from the book to see if they actually happened... it all seemed to be based in historical fact and I loved that about this book. Plus, being able to write a a story through journal entries and other snippets was so clever and creative! This sounds like a lovely read, another one for the list! This sounds like one I'd really enjoy. I discusses drama with my LIT class this term, and we had a good time talking about the stage. I'm also really interested in the author herself! Wow, what a lot to have on her plate and still have a book published. Whew! My daughter just taught me the term dramaturg last night, how funny to see it here today. I think this sounds wonderful. I'm off to find a copy of my own. Ooh, new to me author and this one sounds terrific. Thanks for a great review. I need to add this one to my list. I liked this review enormously. You've convinced me. I'm going to read this. I've already added it to my ever-growing TBR listing. i can't tell you how wonderful it is to read such a lovely review and such incredibly kind comments! thank you so much for reviewing it! This one sounds great - I'm reading more and more historical fiction lately. Glad you love it too. Can I quote you on your first sentence?? I like that.